Dragon Kings Slot Review - Betsoft walks into the Fantasy world! Betsoft’s latest attempt at a Chinese themed online slot machine game is the August 2018 release of Dragon Kings. The game is based on the idea of ancient mythology and this is reflected in various details such as the symbols used on the reels. Play it at a new casino now! Players will find that the reels are filled with symbols of ancient Chinese mythology. The symbols to look out for are the gold hat (which is worth more than any other,) koi fish, green emblem, and gold coins. The Dragon King himself serves as the wild symbol, which transforms into an expanding wild when it lands in the middle of the reels. When this happens, players can win one of the game’s four jackpot prizes (bronze, silver, gold and diamond.) Winning combinations are formed thanks to the expanding wild and are separate from any wins achieved through the presence of the dragon pearl, which acts as the game’s scatter symbol. Behind all this gaming action lies a bright red background that stimulates players as they watch the reels spin. It gets their heart pumping and serves to help make the game a more exhilarating experience. The dragon pearl scatter symbol is the key to unlocking free spins. With three of them on the reels at once players are treated to six spins of the reel without having to place a bet in order to do so. Four of the dragon pearls get players 10 free spins and five of them get 15 spins for free. Each of the four dragons possesses one specific power that can ultimately help players win money. The azure dragon gives players one additional spin of the reels for free while staying locked in place while that free spin is taking place. The white dragon is the expanding symbol which adds another white dragon on either side of the reels. The black dragon takes any regular winnings and triples them every time. The red dragon is the most coveted as it has the power to reward players with a cash prize that exceeds 400 times the amount of their latest bet. 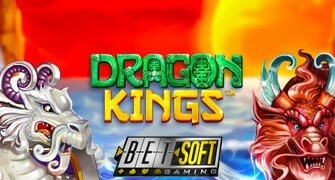 Though Chinese themed slot machines aren’t exactly new or unusual, Betsoft has a hit on its hands with Dragon Kings. The gameplay action is more energetic than that of many other similarly themed games. Certain symbols trigger an eye catching display that only serves to make the game even more exciting. The potential to win big in this game is a large part of the appeal to many of its players. With four progressive jackpots up for grabs, Dragon Kings can be very profitable for the luckiest of the lucky. The out-of-the-box sixth reel makes it even more likely players will walk away with cash winnings that other similar slots just don’t have to offer. For these reasons and more, Dragon Kings is set to become a trailblazer when it comes to the typical mold for any future ancient Chinese themed game.